To meet the legal vision standard to drive you must be able to read a car number plate from 20 metres away. Have you checked that you can do this since you passed your driving test? Your vision changes all throughout your life and it is important that you ensure that your vision remains good enough to drive. 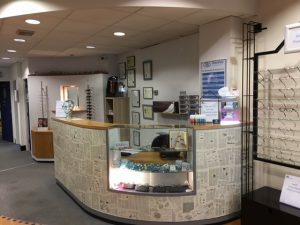 Having a routine eye test allows your Optometrist to check your level of vision and eye health to make sure that you still meet the driving standards. Currently, drivers are tested on their sight before their driving test by being asked to read a car number plate, at a distance of 20 metres. If they need glasses or contact lenses to pass this test, they are required to wear them for driving. A driver must also notify the Driver and Vehicle Licensing Agency (DVLA) if they have certain eye or general medical conditions, or if they are advised by an optometrist or a medical practitioner that they should no longer drive. Once a driver reaches the age of 70, the DVLA requires them to declare whether they are fit to drive every three years.